Walk Hard: The Dewey Cox Story is a hilariously well-crafted send-up of biopics such as Ray and Walk the Line. However if you haven’t seen either of those films many of the more self-referential jabs at the genre may be lost on you. In the film, Dewey Cox (John C. Reilly) is haunted by the death of his musically-inclined brother, who succumbs to a “particularly bad case of somebody being cut in half” after an accident during a machete fight. Riddled by guilt, Dewey quickly picks up the guitar to honor his brother and embarks on the all-too-familiar road to rock superstardom. His journey takes him through just about every musical era of the past half-century, including pop rock, acid rock, folk rock and everything else in-between. Of course, it wouldn’t be a rock star biopic if he didn’t cross paths with some musical legends, and here they include Buddy Holly, Elvis and the Beatles, all played by faces you may recognize. This is a definite star-turn for John C. Reilly, who is typically known for playing ancillary characters in films such as Gangs of New York and Chicago. You may remember him most recently playing second fiddle to Will Ferrell in the lackluster Talladega Nights: The Ballad of Ricky Bobby. While his role in Walk Hard is Ferrell-esque, particularly when Dewey has one of several drug-fueled freakouts, Reilly truly makes it his own. Here’s hoping that Judd Apatow, who co-wrote and produced Walk Hard, has some starring roles lined up for Reilly in the future. Do some of the jokes fall flat? Of course they do. But so much about Walk Hard works that you won’t really notice. It doesn’t hurt that the songs are pretty hilarious. If Dewey singing the line “in my mind you’re blowing me…some kisses” to his soon-to-be second wife (Jenna Fischer) doesn’t make you chuckle, then you’re probably in the wrong theater. 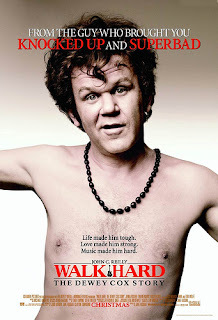 Walk Hard: The Dewey Cox Story is a fun, welcome surprise this holiday season.